Van (pronounced vahn, like the English word one) is in Turkey. The city of Van stands near the eastern shore of Lake Van (Van Gölü), a soda-salt lake also known locally as Van Denizi (“the sea of Van”). This lake, the largest in Turkey, lies 1640 metres above sea level and is ringed by high mountains, so the area has a harsh continental climate. The region is historically important as the centre of the Urartu and Armenian kingdoms. It later came under the rule of Byzantines, Seljuks and then the Ottomans. The old city, near the lake shore and standing on the Silk Road, was devastated in the wars and massacres of 1915 – 1920. The present-day city has been built some 5 km further east inland. It was further damaged by the earthquake of 2011. Buses run several times a day to Ankara (19 hours), Istanbul (25 hours) and all major cities in Turkey, some involving a change to a connecting bus: see Kamil Koc website for times and prices. Buses run from the Otogar, 3 km NW of town centre. Free shuttle buses run from the main ticket offices in the town centre but allow at least 30 minutes before the scheduled departure time. Frequent dolmuses run from town centre to Tatvan (100 km, 2 hrs) via the south lake shore, Highway D300. There are no direct services around the north shore. Dolmuses also run north to Doğubeyazıt (185 km, 2½ hrs). June 2017, the short road is closed and you must take a far longer trip via agri until things settle down. The border crossing to Iran, 100 km away at Kapikoy / Razi, is open for light vehicles, but (as of 2016) no buses or dolmuses cross by this route. Indeed with the suspension of the rail service (see below), this means no public transport across the border by the direct route from Van. It may be possible to make a private arrangement with taxis, but the simplest option is to travel to Dogubeyazit for transport into Iran via Bazargan. Direct trains (the Vangölü Express) run twice a week from Ankara to Tatvan, on the western shore of Lake Van. The journey is scheduled to take 26-27 hours but is often delayed. There are couchettes and a sleeping car but no buffet. The main stops along the route are Kayseri, Sivas, Malatya and Elazig. For details see Turkish railways website at tcdd.gov.tr, but beware that the timetable and the online booking system give different days of running for this service. Note also that Ankara railway station is partially closed for rebuilding until early 2018, with bus replacements to Irmak 60 km east of the city, and altered timings. The Vangölü Express usually arrives in Tatvan mid-afternoon, so you should be able to reach Van the same evening – walk 1 km south to town centre to pick up a dolmus. The train back to Ankara departs about 7 am so that will mean staying in Tatvan the night before: there are plenty of hotels and other facilities. Until July 2015 there was also a weekly international train from Ankara (the Trans-Asia Express) which continued from Tatvan to Iran, via a ferry across Lake Van, then from Van overnight to Tabriz and Tehran. Another train also ran between Van and Tabriz. These cross-border services have all been suspended for reasons variously cited as security and track improvements. Update: according to various media the train between Van and Tabriz has been ressumed and runs twice a week per 18 June 2018. A high-speed line is under construction from Ankara eastwards, with completion perhaps in 2023. It is also intended eventually to build a railway around the lake between Van and Tatvan. This would actually create an unbroken rail link between Europe and the Indian subcontinent; but this project remains an aspiration, with no firm plans. Van (Ferit Melen) airport is 5-10 km south of the city, off Highway D300 towards Tatvan. There are regular flights to Istanbul Ataturk, Istanbul Sabiha Gokcen, Ankara, Adana, Izmir and Antalya. The ride to town takes about 15 minutes. In town, dolmuses for the airport leave from near Hotel Akdamar on Kazim Karabekir Caddesi. The ferry runs three times a day, at variable times, between Tatvan and Van. The lake crossing takes 4 hours. A new ferry was installed in December 2015. Van Castle stands on a 100m-high bluff near the lake shore, with great vistas over the town and lake. Take a dolmuş to Kale (2.25 TL / Sep 2018, 20 min), from anywhere in town centre. “Kale” means castle but also refers to the sprawling suburb north of it, so get out at the castle fence before the dolmuş dives into the back streets. Or you could, on a cool day, walk 3 km here from the centre, but there’s still another 1.5 km to walk along the lane to the official entrance, and later to walk back. From the entrance a broad track zig-zags up through barbicans to the summit. Locals often take a short-cut, and dodge the 5 TL entrance fee, by slipping through the fence near the dolmuş drop-off, and following a rough path up the north side of the bluff. This isn’t altogether safe, and isn’t recommended for visitors. 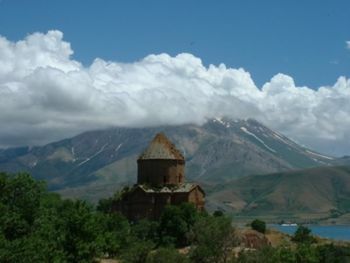 The ancient Armenian church (Ahtamar or Akdamar) on a small island in Lake Van is beautiful. Dating from 921, the church has recently been re-opened after an extensive restoration, making its impressive frescoes possible to see. It is possible to take a dolmus (45 min, 10 TL), signed Gevas / Akdamar, from the minibus otogar in the north end of Cumhuriyet Cd (past Besyol Road), to the boat dock, which lies 50 km west of Van. The ferry across to the island costs 10 TL/person with 16 persons or more. A private boat costs 150 TL. A short wait at the docks for more passengers may prove fruitful if you are an independent traveller. You may take the return ferry one hour after your arrival, otherwise additional ferries that can take you later (don't have to take the same boat back, just take as long as you want on the island). Note that if there are only few visitors, there might be only one ferry per day, and you might have to wait a long time or pay a big extra. Cost for entry to site is 10 TL, and the last ferry leaves around 5:30 or 6pm. The last dolmus back to Van is around 7pm. The old city of Tuşpa a few kilometres west of the city. You can also swim in Lake Van. It's clean and safe - but don't swallow! It's soda-salt, so you'll be bouyant. Be aware that many beaches are not 'mixed' for men and women, so ask a local before you head to one. Local people mainly speak Kurdish. The national language, Turkish, is also very common. People, especially the young generation, understand some basic English. Do not expect more. The city is famous for its breakfast salons (kahvaltı salonu), in which for about 10 lira, you are served a really filling breakfast including locally produced cheese (different types, including "otlu peynir") and honey, tahini, olives, tomatoes, cucumbers, kaymak (similar to clotted cream), and still-warm bread. The price usually includes an unlimited amount of tea. Locals tend to avoid "Breakfast Street", and favor businesses that are just off the main roads. Egg dishes are also prepared upon request, including menemen. There are quite a few bars within the Çarsi (downtown area), but travelers--especially women--should be wary of visiting a pub/restaurant hybrid, as it's typically known as a place to find 'companionship'. Niçe is just off of Maras Street, and offers opera on television, and various western music. Small, loud, and smoky, Niçe has a great 'dive bar' aesthetic. Workers are accustomed to the seeing the occasional foreigner, and do their best to accommodate. In Winter, they serve mulled wine. The Lop Bar is between Cumhuriet and Sanat Street, on a second floor walk-up. There's live music most weekends, a staff that's helpful, large operable windows, and affordable prices. Be sure to get a 'şişe' (bottle). Decent cocktails are available. The North Shield is tucked away in the back of Tamara Otel (just between Sanat and Maraş Streets). Upon entering the hotel, head left through a sliding door, down a hall, and up the stairs. While slightly more expensive than other bars, football matches are generally shown in a British pub reproduction and the air has adequate ventilation. Eskici is a cafe/garden in the middle of the city apparently known among students, travelers and generally young people. Entrance is from Cahit Akyüz Sk. (Street), No: 23. You enter through a discrete staircase, only a small wooden arrow sign reveals Eskici from the street. Then you reach two upstairs terraces with amazing multitude of plants and flowers. They serve tea, coffee, soft drinks. No food - but they totally don't mind if you bring outside food to eat here. There is backgammon (tavla) game. Friendly staff will be up for a chat if you want, as well as other visitors, all respect each other and it's a great vibe. Every Friday film night. Every Saturday (19:30) live music, and it gets really full. Open every day 8 AM-ish till midnight. Plenty of hotels around the northern end of the bazaar. The border with Iran is 100 km east at Kapikoy. Currently no public transport takes this route. Doğubeyazıt 100 km north (2 hours by dolmus) has the stunning İshak Pasha Palace, and the legendary Mount Ararat—the highest mountain of Turkey. If possible, detour to Muradiye Waterfalls, located off Highway D975 between Doğubeyazıt and Van. Doğubeyazıt has good road connections to other cities in Turkey and is the main access point for Iran. (Get your visa well in advance, there are no visa facilities here.) June 2017, the short road is closed and you must take a far longer trip via agri until things settle down. This page was last edited on 29 September 2018, at 19:21.